We have a great selection of dog toys and accessories for you to spoil your dog with. From squeaky dog toys to personalised dog toy bags to store all your dog's favourite toys, we have everything you need to pamper your pup. Why not freshen up your dog's collar with a new designer dog tag? Most of our luxury dog tags come with free engraving and free delivery to your door. We have some luxurious dog towels to wipe those paws clean after a nice walk and we also have some very eco-friendly poo poo bags to scoop that poop! Play time is probably one of your dogs favourite time of day. Providing your dog with a variety of dog toys is essential for keeping your dog happy and healthy. Here at Chelsea Dogs we have searched high and low to find you the best dog toys on the market. For the girls we have the Sniffany & Co Box or Bone, a Stella MuttCartney Shoe and a Roberto Pawvalli Leopard print handbag. 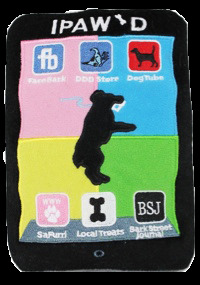 For the boys we have an iBone, an iPaw’d and a Dogverse Sneaker. All of these luxury dog toys have the essential squeaker inside to ensure your dog will drive you crazy whilst having the time of his life! For doggies that love to chew, a Stagbar is an absolute must-have. 100% naturally shed deer antler is the perfect teething aid for puppies and a great long-lasting chew for adult dogs too. Chewing releases feel-good chemicals into your dog’s brain so instead of your dog destroying your furniture, give him a Stagbar! Most pets have a whole basket full of toys but if you need somewhere to store them out of site, have a look at our lovely dog toy bags which are handmade in the UK exclusively for us and you can even have your dog’s name embroidered on the bag. These make perfect bags for storing your dog’s toys, treats, food, bowls and more for when he goes on a sleepover or to a luxury pet hotel!